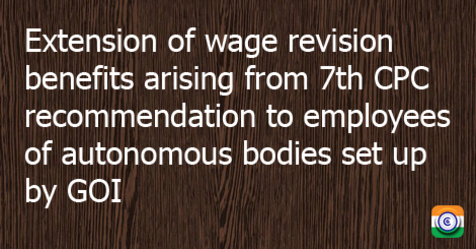 Subject : Extension of wage revision benefits arising from 7th CPC recommendation to employees of autonomous bodies set up by GOI- Reg. The autonomous bodies set up by GOI normally follow the central pattern of Pay Scales and service conditions. The Ministry of Finance is to issue the requisite coders as and when pay commission recommendations are accepted and implemented in so far as Central Government Employees are concerned to extend the said benefit to employees of autonomous bodies. To give effect to 6th CPC recommendations, orders were issued on 30.09.2008. So far no order has been issued by the Govt extending the 7th CPC benefit to employees of autonomous bodies. We request that the same may please be expedited. In respect of employees who are on permanent deputation to such autonomous bodies, the Revised Pay Rules, 2016 notified as GSR 721 (E) dated 25.07.2016 is applicable. However. it has been represented to us that some of the autonomous Bodies have not extended the benefit to the employees on deputation, probably due to an incorrect understanding of the issue. We request that the autonomous bodies may be advised to implement the notification in the ease of employees/officers on deputation to autonomous organization without waiting for a formal order from the Ministry of Finance.